This preserve is open to the public every day between sunrise and sunset. Goemaere-Anderson Wetland Preserve is 10.77 acres of cattail marsh located just west of Wixom. The property is immediately south of Lyon Oaks County Park and is a continuation of the wetland complex found at the park. There are no trails on this property. Parking lot is on the north side of Evans Rd at 5700 Evans Rd., Holly, MI 48442. You'll see a trail map and preserve rules on the kiosk at the trailhead a few steps in from entrance. Follow trail markers and please stay on trail. Click here for a map. Take Holly Road to Evans Road, turn east and travel about 1.5 mile. Look for the Lost Lake Nature Preserve sign and parking lot. 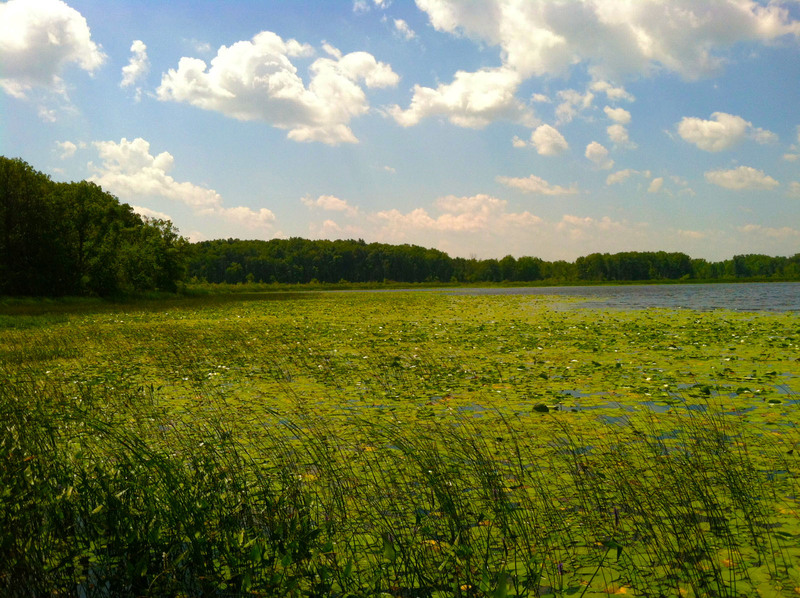 Lost Lake Nature Preserve is a regional treasure that showcases the natural heritage of Genesee and Oakland counties. The preserve contains two pristine examples of kettle lakes, a magnificent wetlands complex, beautiful glacial moraines, mature forests and open meadows. Slack Lake (shown here) is one of two lakes in the Lost Lake Nature Preserve. SMLC received a $1.1 million donation from an anonymous donor during the summer of 2013 that funded the purchase of the property. Six Rivers Land Conservancy worked with SMLC to place the conservation easement on the property at the time of acquisition. Genesee County, Grand Blanc Township, Holly Township, and Oakland County are all highly supportive of this property being protected and SMLC looks forward to working with our community partners to support public use of the preserve in the future. Flint River watershed, Swartz Creek subwatershed. 2 lakes: Slack Lake (52 acres), Bloat Lake (7 acres). Designated as a hub within Oakland County Green Infrastructure Vision. Within Michigan Natural Features Inventory Potential Natural Area designation Priority 2. Large wetland complex surrounded by rolling woodlands. Identified land types include: Emergent Marsh, Scrubshrub (Southern Shrub-Carr) and Forested (Southern Hardwood Swamp) wetlands. SMLC’s future plans include stewardship management. In fall of 2015 the Preserve Loop Trail was opened to the public. The trail is approximately 2.5 miles in total length. It meanders through a dense forest which eventually opens up to an old private airport runway that is now grassland. Near the northernmost arm of the runway is a scenic overlook of Slack Lake. Past the overlook the trail follows the lakeshore through an old growth forest before it connects up again with the runway.